Simple, yet refined and delicious! These are some really tasty flavours! Coincidentally I just had something very similar for lunch though it was haddock and I did it on the stove top. Lemon and capers is a great flavour combo with fish! I should have added some dill to mine as well. Any way of preparing Glossa is good fro me. Your dish looks very nice. Great recipe. This looks refreshing and delicious! 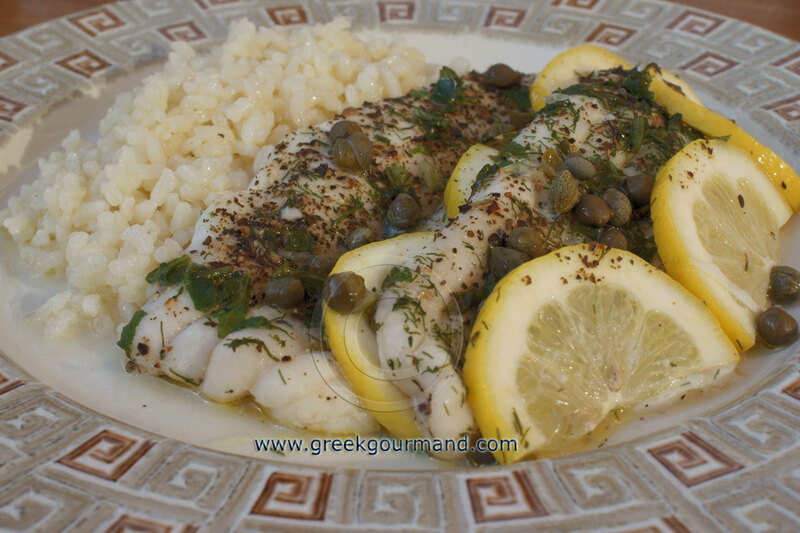 One of my favorite go-to recipes is pan-seared sole with lemon and herbs so I enjoy sole often. This recipe takes it to another level! And thanks for the Santorini travel tips, btw. Santorini. You reminded me of the beautiful memories I have from this gorgeous island. I am Katerina I live in Athens and I came across your blog. This fish dish looks great. I have been surprised by how much Greeks use dried oregano in their cooking. I am from Argentina and, even though we don't use many spices and herbs, we do use dried oregano in vast quantities and now I'm wondering if those were the Greeks immigrants' influence there. Anyway, I'd like to make this dish and include it in my blog with my own photos. I will also link to this blog and mention this blog as the source. Please let me know if it's OK to do that. Hi, I came accross your page and everything looks great. I'm about to make your loukoumades, hope they're great even without Greek honey. I was wondering if you had a galaktoboureko recipe. It's one of my favorite sweets! Thanks and good job on the page. 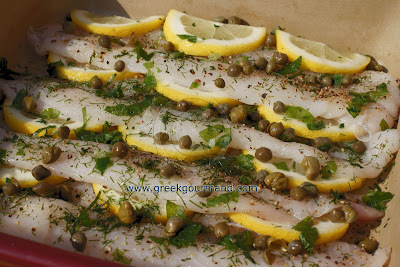 silly question...when do i add the capers? ?